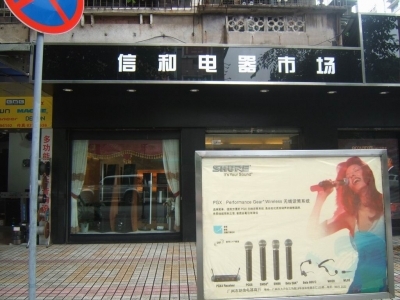 Xinhe Haiyin electrical market in Guangzhou Dongshan District, south of big sand three or four streets, and is the market in Guangzhou Haiyin electrical components. The market covers an area of ​​operations area of ​​1400 square meters, to operate various types of high-tech, high-end brand-name appliances known commodity. Such as: JBL, Augustine, Onkyo, Ph.D., Skyworth, Malata, odd sound, Kim ... ... a variety of domestic and foreign brand-name merchandise. Enliven the market recently, the introduction of a number of stage lighting, audio, broadcast equipment firm, operating various types of imported and domestic brands lighting, audio and broadcast equipment. The market for economic development, civilization, business, service improvement, climate, good order, shopping safety, security, business and consumer legal rights and interests as the goal, insist to keep their promises, quality assurance, customer first, service management approach in the Guangzhou Sea Indian regional economic prosperity, continue to scale new heights!